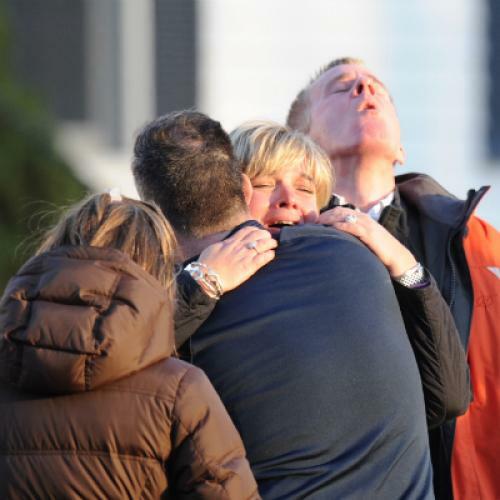 "As a country, we have been through this too many times," said President Barack Obama on Friday afternoon as he wiped tears from his eyes while addressing the horrific shooting at a Connecticut elementary school. He might have added, "this year." Because it's not your imagination--while mass shootings have terrified and grieved us over the past three decades, this year has been the worst by far. With more than 140 casualties (injuries and deaths), the toll from mass shootings in 2012 has been nearly twice that of any other year. And that isn't even counting other shootings that have captured national attention, such as the attack in a Portland-area mall this past weekend or the gunfire at a suburban Cleveland high school in the spring. The FBI defines a mass shooting as one in which at least four people are killed, not including the gunman, so those incidents don't count in the statistics. It can be difficult to get a sense of the scope of mass gun violence when we look at individual tragedies--especially when, as now, it is so hard to get past the heart-stopping thought of all those children and all those families. So let's look at the facts, the hard numbers. As of today, there have been 70 mass shootings in the United States between 1982 and 2012, leaving 543 people dead (assuming the reports of 27 fatalities from today's shootings are correct.) Seven of those 70 shootings occurred this year. Sixty-eight of those 543 victims were killed this year. If the scenes of horror and heartbreak are now familiar, it's because the past six years have been particularly bloody. Fully 45% of the victims of mass shootings in America over the past three decades were killed since 2007. That is a crisis. It's time to stop sniping at each other on Twitter over whether we should blame mass shootings on guns or on mental illness. Both gun control policy and our laws regarding the mentally ill could use radical rethinking. Just as it's time to stop insisting that the debate is over new gun control or stricter enforcement of existing laws when Americans support both. It's time to stop issuing statements of sorrow and then holding our breath until the next man with a gun mows down his fellow humans. It's time to stop pretending that mass gun violence could be limited if only more of us were armed. Do we seriously want armed guards in every elementary school in America? It's time to stop letting gun manufacturers speak on behalf of gun owners, who are far more likely to support gun restrictions. And it is long past time to stop taking seriously anyone who would claim that God allows gun massacres in response to U.S. Supreme Court rulings or what they believe to be insufficient levels of religious belief. They do not speak for my God, and I pray that their words do not add to the already crushing grief of the families who mourn today. I can't say exactly why mass shootings have become such a menace over the past few years, and especially in 2012. But I can say that this is not a problem without answers. The time may even have come to change our very American embrace of guns. Such a huge cultural shift usually requires a dramatic impetus. September 11 changed overnight the way we think about the balance between security and personal freedoms. Surely the killing of little children among their tiny chairs and big pencils should prompt us to take steps to make mass shootings as rare as they once were. A note about sources: We started with Mother Jones' comprehensive report on mass shootings in the U.S. over the past 30 years, which was published in July 2012 and updated in September. We then checked each of the 59 incidents they mapped (as well as 11 qualifying attacks that they didn't) against news reports to confirm the number of fatalities.